TAMO Bistro & Bar Chef Robert Tobin and his TAMO burger are putting their buns…er…armor on and heading to battle tonight thanks to all of you who voted! The Top 25 vote recipients in Boston magazine’s 5th Annual Battle of the Burger have been tallied, and they duke it out tonight to see which patty comes out on top! Head to Cruiseport Boston near the hotel at 7PM for an all-you-can-eat affair, but don’t forget to come with an empty stomach: you only get one vote! Our TAMO burger is a Grade-A masterpiece nestled between brioche buns. 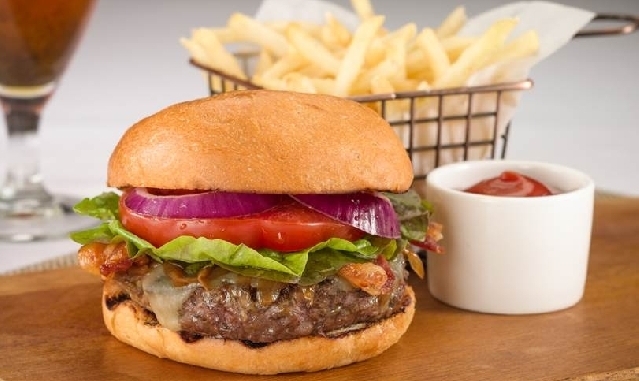 Thick with white cheddar cheese, caramelized onions, bacon, lettuce, Backyard Farms beefsteak tomatoes, and a Jett's Mild pickle, our beef will leave you salivating! For tickets, head to bostonmagazine.com/burger, as they won’t be available at the door. Get a mooove on it, and don’t forget to vote for TAMO!